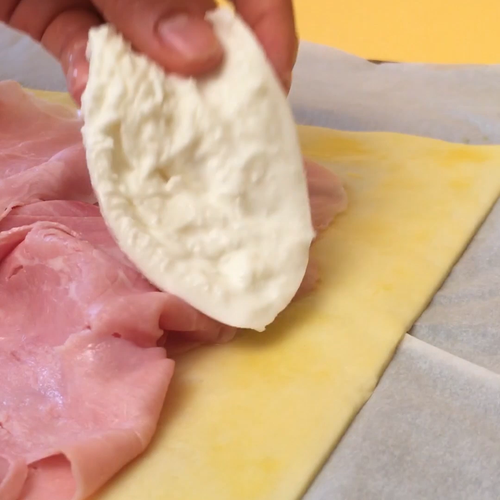 To prepare the base: Cut a square as large as possible in the first sheet of puff pastry, then brush the edges of the square with beaten egg, place the slices of ham and slices of mozzarella in the centre then sprinkle with salt and pepper. To prepare the checkerboard top: Cut another large square in the second sheet of puff pastry, and cut it all into 2cm wide strips. Position one strip vertically over the ends of the others on the left of the square. Fold the top strip back over the vertical strip of pastry, then do the same for every other strip. To finish, cut the peppers into strips about 1.5cm wide. To prepare the grid: Arrange a strip of pepper of the same colour in a line alongside the vertical pastry strip, then cover over with the folded back strips of pastry. Fold the second set of pastry strips back to the left and place another line of pepper strips of another colour. Repeat the process alternating the peppers and strips to form a checkerboard. Arrange the remaining 3 strips of of pastry on the outside frame to create a border around it. Place the checkerboard sheet onto the base and press lightly so the egg sticks the dough together. Paint beaten egg over the tart with a brush. Bake for 30 minutes at 200°C and then enjoy hot.